Windstar Lines of Nebraska has the ability to make your charter travel dreams a reality! Request a quote and start your next adventure. Give us a call today! Windstar Lines is your best choice for Bus Rental in the Omaha and Lincoln area. We can provide the services you need to travel across town, or across the country! Whether you're traveling within Omaha or leaving from the city on a trip, Windstar Lines is the motorcoach service for you. Omaha is an extremely diverse city built upon the skills of knowledge jobs. Home to 5 fortune 500 companies and the biggest city in Nebraska, Omaha is a busy area. It has designated historic structures and districts that have become one of the success stories of the historic preservation movement in Omaha. Being a large city, Omaha is a popular shopping destination with great entertainment and dining. See all that Omaha has to offer with Windstar Lines, your leading Bus Rental service in Omaha. If you already live in the Omaha area and are interested in seeing any of the 48 contiguous United States or Canada, then Windstar wants to help. We have different sizes of buses, with the variety of options. We offer an 11 Passenger Mercedes Van, all the way up to a 56 Passenger Deluxe Motorcoach. We even offer a very special 28 Passenger VIP Sleeper Motorcoach. We are certain to have something for everyone. For all your bus rental Omaha and Lincoln needs, count on Windstar Lines. Established in 1995, Windstar's goal is to provide our customers with safe and comfortable travel. Our luxury motorcoaches are the best choice you and your group can make when traveling across the county. We are extremely picky about choosing who sits behind the wheel. Your SAFETY is our number one priority, with top notch customers service a close second. Our drivers are the best in the industry. These well trained men and women genuinely care about the well-being of you and your group. We provide luxury charter bus service and midwest tours. Our customers include high school groups and teams, tour companies, college and university teams, military groups, senior citizen groups, and government agencies. 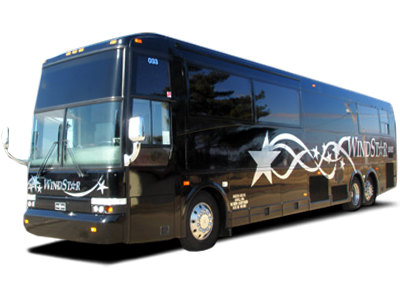 Our Bus Rental in Omaha should be your first choice when it comes to motorcoach transportation. On your next adventure in Omaha, think Windstar Lines for your ground transportation needs. Our charter bus service in Omaha provide high-quality vehicles. Each vehicle is video equipped and has WiFi. We offer a variety of buses and motorcoaches for you to rent. 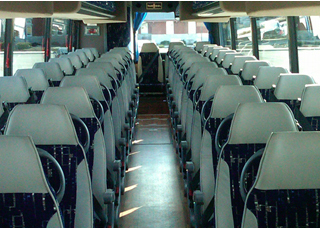 We provide seating for 20 to 56 passengers. If you need bus rental service for a wedding or airport transfer, we can offer you our 20 passenger motorcoach. They are outfitted with 1-2 video monitors and great for traveling in a small group. The 47 and 56 passenger coaches are equipped with DVD players, reclining seats, and a on board restroom. We also have Sleeper buses that easily converts your seat into a bunk bed. If you want to ride in style and ultimate luxury, we have the 28 passenger VIP luxury bus. It has a kitchenette, over-sized bathroom, sofa, and two flat screen televisions. We provide services throughout the Nebraska, Illinois, and Iowa area. No matter what you need, Windstar Lines of Nebraska can assist you. Contact us today! We can provide an estimate.